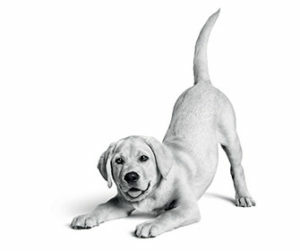 Home » Articles » How Much Exercise Does a Labrador Need? Initially bred for very physically demanding tasks that included hiking, running and swimming, Labradors are a highly active breed of dog. Though they are often seen as the ideal family pet due to their good-temperament and strong will to please, they are still full of energy due to possessing the same genetics that they were bred for. This means that a Labrador requires plenty of exercise in order to release energy and live a happy and stable life. Inadequate opportunities for exercise could result in behavioural problems and, of course, weight gain. But how much exercise should you provide your Labrador with? While there’s no d efinitive answer on an exact optimal amount that encompasses all Labradors, there’s usually an amount you can use as a guideline depending on your type of Labrador. A healthy adult Labrador Retriever will need approximately 1 hour of exercise per day. Labradors with more relaxed dispositions will need just 45 minutes each day, and particularly energetic Labradors will need anything from 1.5 hours and above. This can be across multiple exercise sessions and can be made up of running, swimming, playing fetch, jogging alongside you…anything that goes beyond a gentle walk. Elderly Labradors, or Labradors that have slowed down due to mobility problems or other health issues, should be exercised carefully in order to avoid aggravating any health problems. However, regular exercise is still critical to health and well-being, as any weight gain will have a detrimental effect on existing health problems. Therefore, exercise time should not only be shortened, with more frequent, shorter walks for example, but the types of exercise might need to change too. Gentle walking and swimming will be of the most benefit to elderly dogs, especially if they suffer with joint stiffness. While consistency in exercise is helpful for all dogs, a consistent routine of activity is especially important for older dogs. In regards to Labrador puppies, they do not require any form of “structured” exercise from birth up until 3 months old, as they are only small, tire easily and get sufficient exercise from their normal play with their mother and siblings. While exercise and activity is crucial for puppies, and will allow vital socialisation opportunities, this need must be balanced with the risk of over-exercising while the puppy’s bones and joints are still developing. A commonly used exercise practice for Labrador puppies from 3 months+ is to count 1 month as 5 minutes, and plan structured, deliberate exercise with them up multiple times a day depending on how many months old they are. For example, 15 minutes for a 3 months old Labrador, 20 minutes for a 4 month old, and so on. This will allow them to release excess energy without exhausting them. Continue with the 5 minute rule until your Labrador puppy is at least one year of age. Then, regular exercise as an adult Labrador, as discussed above, can commence. How can I tell my Labrador is being sufficiently exercised? Training issues, hyperactivity and behavioural problems are all possible consequences of inadequate opportunities for exercise. If they’re putting on weight but there has been no change to their diet in type or quantity, this could also be a sign that they aren’t getting enough exercise. However, if your Lab can relax at leisure, isn’t destructive, obeys commands and looks athletic as opposed to overweight, then it’s almost certain that they are getting enough exercise.